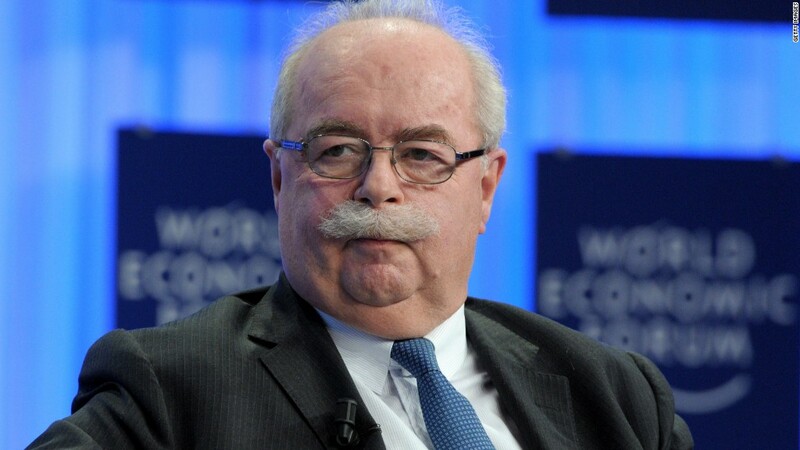 French oil company Total's CEO died after his plane collided with a snowplow on the runway at Moscow international airport. Russian officials said the snowplow's driver was inebriated. Along with CEO Christophe de Margerie, three other members of the plane's crew were also found dead at the scene of the accident. Russian officials have said they would investigate other possible causes of the accident such as pilot and air traffic control error. The crash occurred when the landing gear of the Falcon airplane hit the snow-clearing machine during takeoff, then caught fire and crashed on the runway. The death of the 63-year old de Margerie was immediately mourned by top leaders. Affectionately known as Big Mustache for his signature facial hair, de Margerie had a "larger-than-life personality" and was "hugely respected" in French business and political circles, according to the Financial Times. The company released a statement sending condolences to the families of all the victims. De Margerie attended Putin's annual economic showcase in St. Petersburg in May, ignoring calls for a boycott over the crisis in Ukraine. Total is a major shareholder in Novatek, Russia's largest independent natural gas producer. The two companies were planning to develop a massive liquified natural gas reserve in Siberia. But the shooting down of a Malaysian airliner over eastern Ukraine in July prompted Total to suspend buying additional shares in Novatek. President Vladimir Putin expressed his condolences in a telegram to French President Francois Hollande. In the message, Putin praised de Margerie for his role in laying the foundation of "long time fruitful cooperation between France and Russia in the energy sector." De Margerie joined Total right after finishing university in 1974. He has held several positions with the company, including a job leading its Middle East operations. He was named CEO in 2007, and appointed chairman in 2010. In an interview with the Financial Times, de Margerie said he rarely admitted regretting anything, except not being able to spend enough time with his children. "I used to think quality time with my children was good enough, but quantity matters," he told the newspaper. French President Francois Hollande expressed shock and sadness and praised the CEO for his "independence, original character and dedication to his country." Manuel Valls, the French prime minister, said the country would miss de Margerie's "panache," his typically French sense of humor, and a spirit that was "unanimously appreciated." -- Ben Rooney, Charles Riley and Mark Thompson contributed to this article.